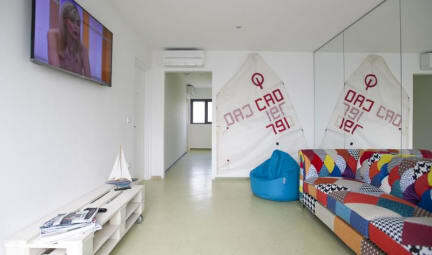 Windward Hostel Zadar is a brand new sailing themed hostel in Zadar which offers you a great combination of our two biggest passions - sailing and traveling. If you visit us we'll make sure to offer you not only a pleasant stay but a great guideline to sailing and how we do it here. ​Feel free to enjoy the dayroom where you can find comfortable designer couch, sitting bags, big screen TV and coffee and snacks machine. Windward Hostel Zadar is situated 1,5km from the old town Zadar and represents the top offer in the hostel accommodation. The Museum of Ancient Glass is 1.2 km from Windward Hostel Zadar, while Five Wells Square is 1.3 km from the property. The nearest airport is Zadar Airport, 9 km from Windward Hostel Zadar. 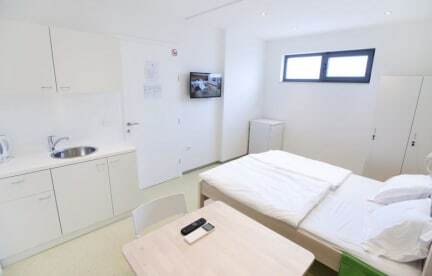 The hostel disposes with 20 beds divided into 5 fully equiped rooms. All rooms are equiped with beds made out of wood and very comfortable matraces. You will be welcomed with clean linen including one free towel. Every bed has it's own personal space enriched with private lamp and practical 'box' for personal things such as books, mobile phones, etc. Next to every bed have been placed private lockers for storing personal items. We thought of your increased need for charging laptops, ipads and smartphones so we enabled you with two electrical plug ins right next to your bed. ​Every room is air conditioned. All windows have electrical blinds. Some of the rooms have their private sink with the mirror. ​Beside the multiple bed rooms, we're offering you a private room equiped with king size bed, 2 lockers, TV, small kitchen and a private bathroom. Check in from 12:00 to 21:00 . Other check ins possible with a former agreement. The reception is opened from 8am until 22pm.